Book now available at: Amazon.com & BarnesandNoble.com. 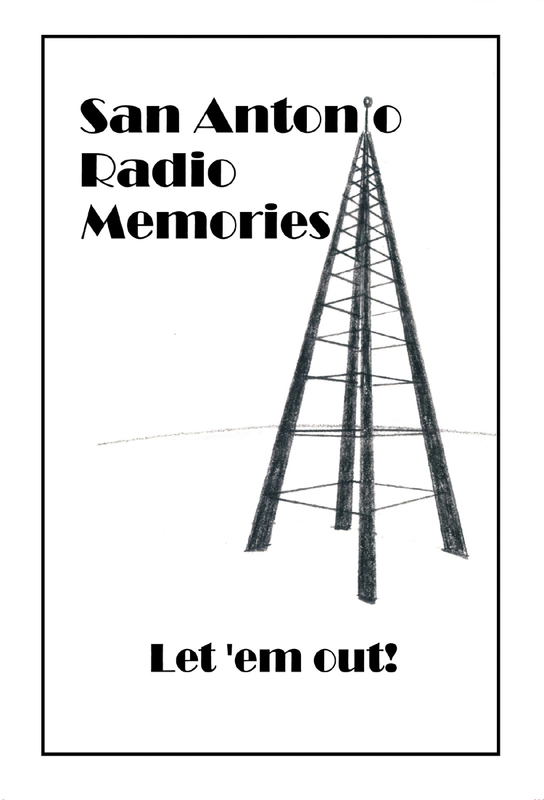 The purpose of San Antonio Radio Memories is to provide a clearinghouse for those who wish to share and preserve San Antonio Radio Memories (stories, photos, audio, etc.). This incarnation of the website (Version Two) will include more audio than the previous version. If enough material is collected, it will be compiled into Book Two. Fill out the form at the bottom of this webpage to find out how to make a submission. Click HERE For SARM Contact/Question/Comment Form. Copyright 2006-2019 by SanAntonioRadioMemories.com – All Rights Reserved. All product names, logos, brands, service marks, registered marks, trademarks, etc. that appear anywhere on the SanAntonioRadioMemories.com website are used only as part of a description and remain the property of their respective holders. SanAntonioRadioMemories.com in no way sponsors or endorses any product name, logo, brand, service mark, registered mark, trademark, etc. Additionally, SanAntonioRadioMemories.com is not sponsored by any product name, logo, brand, service mark, registered mark, trademark, etc. unless specifically mentioned as a sponsor. SanAntonioRadioMemories.com exists specifically to archive historical information about San Antonio Radio, broadcasting and other interests that occurred during the 20th century as remembered and/or related (as much as possible) by those who were “there when it happened.” SanAntonioRadioMemories.com is not responsible for any factual errors that may occur on this website. If encountered, attempts will be made to verify and correct errors in a timely manner. Anything submitted to SanAntonioRadioMemories.com implicitly assigns all publication rights (whether by electronic or printed media) of whatever is submitted to SanAntonioRadiomemories.com. All submissions are subject to editing. Submission of material does not guarantee posting and/or publishing. All audio contained on the SanAntonioRadioMemories.com website is used by permission and/or the "fair use provision." In all matters SanAntonioRadioMemories.com liability is limited to removal of items not found to be in compliance. All profits from any books published will be donated, through known reputable organizations, for scholarships to qualified individuals who want to pursue a career in Radio Broadcasting and/or to a nationally recognized reputable charity or charities.